About 80% of the organism's body is H2O. Its molecule has a small negative charge (β-) on the O atom a small positive charge (β+) on each H atom. This is called a dipole. This makes H2O an excellent solvent. 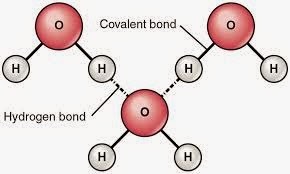 Hydrogen bond = attraction between (β-) and (β+) parts of neighbouring H2O molecules. The dipoles on H2O molecules make water an excellent solvent. If you stir NaOH into H2O, the Na+ and Cl- separate and spread between the H2O molecules --> They dissolve in the water. The Cl- is attracted to the small (+) charge on the H of H2O molecules. The Na+ is attracted to the small (-) charge on the O of H2O molecules. separate into ions, can dissolve in water. - To transport substances around the bodies of organisms. The blood plasma of mammals is mostly water, and carries many substances in solution: glucose, oxygen, ions (Na...). - To dissolve reactants ---> enable metabolic reactions. 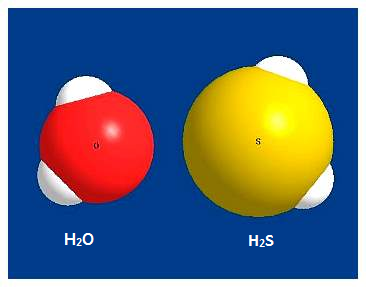 The H bonds between H2O molecules prevent them flying apart at normal to. Between 0oC and 100oC, water is in the liquid state. The H2O molecules move randomly, forming transitory H bonds with each other. Other substances with similar molecule structure, such as hydrogen sulfide (H2S), are gases at these to (no H bonds to attract their molecules to each other). When a liquid is heated, its molecules gain kinetic energy, moving faster + a lot of heat energy is needed to break H bonds between water molecules. Those molecules with the most energy are able to fly off into the air. When H2O evaporates, it absorbs a lot of heat from its surroundings ---> The evaporation of H2O from the skin of mammals when they sweat and the transpiration from plant leaves has a cooling effect. Specific heat capacity is the amount of heat energy that has to be added to a given mass of a substance to raise its to by 1oC. The higher the kinetic energy the higher the to: a lot of energy is needed to raise to (to ↑ speed of H2O molecules + break H bonds). ==> Bodies of H2O (oceans, lake) do not change to as easily as air does. 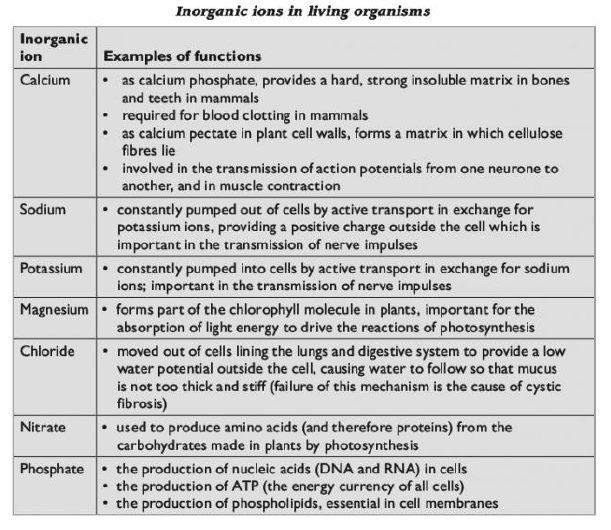 Bodies of organisms (with large amounts of H2O) do not change to easily. Most substances are more dense in solid form than liquid form and will sink if submerged in their liquid state. But H2O is LESS dense in its solid state, and will float. This has to do with the crystal structure of ice. 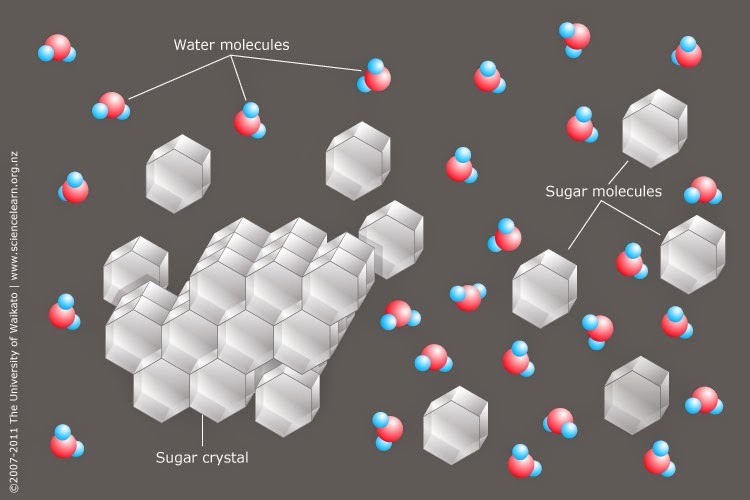 When water cools (to↓) the density of water ↑ (molecules lose kinetic energy, getting closer). Below 4°C this trend is reversed: When H2O approaches freezing point, molecules form a lattice and stretches its very elastic H bonds --> density↓ (lower than density at 4°C) --> Ice floats on water. The layer of ice acts as an insulator, slowing down the loss of heat from H2O beneath it, which tends to remain at 4°C. The H2O under the ice remains liquid, allowing organisms to continue to live in it even when air temperatures are below the freezing point of H2O. Water is a special molecule with extraordinary properties that make life possible on this planet 150 million kilometres from the Sun.